Memorial Day, formally known as Decoration Day, was originally started by a group of African Americans. Yes, The History Channel and many other credible historians have confirmed that the popular holiday was, in fact, initially an event held by newly liberated Blacks in Charleston, South Carolina. It happened on May 1, 1865 right after the Civil War ended. Thousands of newly freed slaves and regiments of the U.S. Colored Troops gathered to march around a Confederate Army prison camp in honor of the unnamed fallen Union soldiers who fought for their freedom. Yes, that's right. A day that originally celebrated Black liberation was now being utilized for white supremacy, and it apparently all started from an 1865 article that was published in the Charleston Daily Courier that tried to discredit the facts. 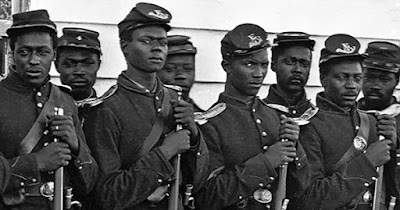 After discovering that news article, many historians have agreed that after being freed, one of the first things this group of African Americans did was gather to pay tribute to those who died while fighting for freedom. Sadly, you usually don't hear that part of the story. According to LiberationSchool.org, "the spirit of the first Decoration Day - the struggle for Black liberation and the fight against racism - has unfortunately been whitewashed from the modern Memorial Day."